Adzync – It allow you to earn free paytm cash online by watching ads and ad video along with it has a cool affiliate programme. So let us keep a look in the steps. 2. Now Click on register and register an account by filling some details. 4. Now it will ask to link your paytm Wallet so add your paytm number and verify it by OTP. 5. Now click on drop down arrow at right side and select the option watch ad. 6. There you will see 5 Ad videos just watch all ( start the video and close after 3-4 seconds ). 6. Now you will get 50 More points. 7. 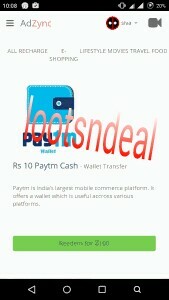 Now redeem your earning sin the form of paytm COUPONS. THERE AFFILAITE IS SAME AS FLIPKART OR ANY OTHER. YOU ALL HAVE TO SHARE YOUR AFFLIATE LINK AND IF ANYONE JOIN FROM YOUR LINK YOU WILL GET COMMISSION AS 10% OF HIS LIFETIME EARNING.